In this example we are going to create a simple MSI that deploys a two files. This is not that much different than one file, but there is an implementation decision you have to make here that is important to understand. Enter a Name for the project. I called the project I made for this walk-thru MultiFileProject. Ok, I hope that was easy for you. Lets move on. 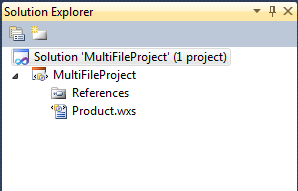 Right-click on the project name, MultiFileProject, and from the drop down, choose Add | New Item. Name it whatever you want. I used the default value, TextFile1.txt for this example. Repeat the steps above to create a second file. My second file is TextFile2.txt. Your files are now added to the Visual Studio project. However, they are not automatically added into the Product.wxs as a file to be installed. This is done manually in the next step. Notice that the second line is not marked with the KeyPath attribute. Only one file node (or maybe a registry node) can set KeyPath. Ok, you are done. Yes, that was all there is too it. Feel free to add as many files as you want. Right-click on the project, MultiFileProject, and choose, Open Folder in Windows Explorer. MultiFileProject.msi – This is the MSI and is all you need. MultiFileProject.wixpdb – This is a file for debugging only. You may never use it unless you need to debug. Note: If on a 64 bit system, it will by default install as an x86 app, so look in c:\program files (x86)\ for a folder called MultiFileProject. Congratulations. You just use WIX to create an MSI that deploys multiple files.